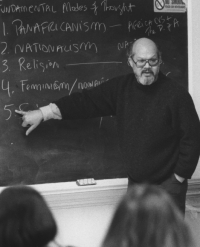 Teaching at the University of Toledo, c1997. 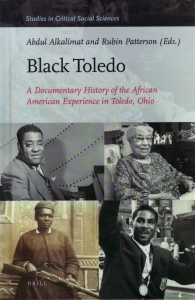 My latest book is Black Toledo. I directed the Black Studies Program at the University of Toledo from 1996 to 2007. This book is a result of digging deep into the history of the community. I was also an activist fighting for change in that post-industrial city, a city with deep contradictions. My previous book, co-authored with Romi Crawford and Rebecca Zorach, is about the Wall of Respect, a 1967 mural created by an organization I helped found while a graduate student. The project sparked the creation of more than 1500 murals worldwide. My research documents the development of Black Studies as an academic field of study and examines various aspects of the Black experience. Black Studies is the production, distribution, and use of knowledge about the Black community, especially information that serves the needs of the Black community. My academic training began with an undergraduate double major in sociology and philosophy (Ottawa University), followed by a PhD in sociology (University of Chicago). I have been part of Black Studies at institutions in all four regions of the country and edited the main Black Studies listserv, H-Afro-Am, from 1998 to 2014.